If you’re one of those people who have been so busy shopping and preparing for the holiday season that you haven’t taken a single moment for yourself, we suggest you read on. There are many special festivities being held all over the Grand Strand and they only come around at this time of year. Treat yourself to a day or evening out and make the most of them. While the holidays are very much about giving, that should include giving to your self! Why not put a gift certificate under the tree this year with your name on it for a stay in a holiday rental at Myrtle Beach Resort! Santa thinks you’ve probably earned it. The Great Christmas Light Show is being held at the North Myrtle Beach Park and Sports Complex (150 Circle, Little River) from December 13 through December 30. This is affordable fun for the whole family. For 1-15 guests, the cost per vehicle is $15. For more information on hours and prices, follow The Great Christmas Light Show on Facebook. Enjoy the sights and sounds of the Holiday Season as the City of Conway creates a new tradition, the Conway Celebration of Lights. This driving light show is approximately 1 mile long and features thousands of lights and unique displays. The event runs through Sunday, January 1. Gates open at 5:30 p.m. each night. The Celebration of Lights is located on Marina Drive and Elm Street. Enter by 3rd Ave. and follow the signs. On Friday and Saturday evenings, special attractions such as a live nativity scene, live music performed by local groups, s’mores station and other fun events will take place. 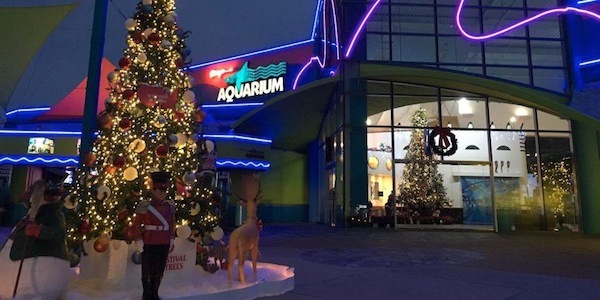 Don’t miss the Festival of Trees at Ripley’s Aquarium taking place through December 31. More than 50 trees will be uniquely decorated to represent each state in the country. Ripley’s is located at 1110 Celebrity Circle, Myrtle Beach, SC 29577. The Calvin Gilmore Theater is transformed into a winter wonderland where the magic of the season comes alive in The Carolina Opry Christmas Special. This dazzling, jolly, and sentimental musical celebration of America’s best loved holiday takes place through January 1, 2017. Dubbed “Father Christmas” by McClatchy papers, Calvin Gilmore produces and directs the show with his usual award-winning flair for production. Located at 8901 North Kings Highway, Myrtle Beach, SC. The Carolina Improv will be having some great improv comedy shows for ages 18+ between now and the end of the year. Not Home for the Holidays will be at 7:30 p.m. on Dec. 14, 17, 21, 23 and 30. 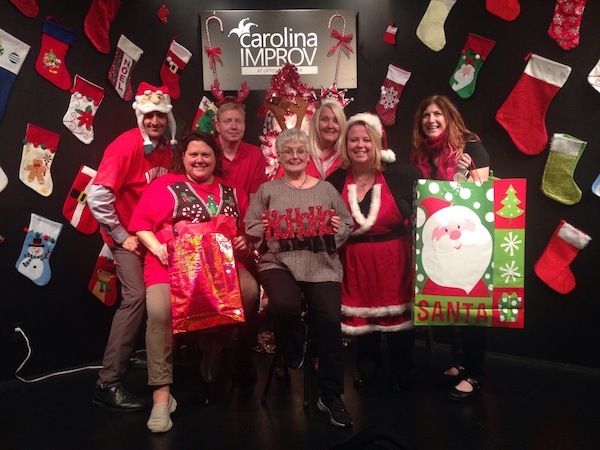 The Ugly Holiday Sweater Improv will be at 7:30 p.m. on Dec. 16 and 22. Talkin’ Bout My Resolutions will be at 7:30 p.m. on Dec. 28. Location: Uptown Theater at the Myrtle Beach Mall, 10177 N. Kings Hwy, Myrtle Beach. Tickets can be purchased online. All of us at Myrtle Beach Resort would like to wish you and yours a very Merry Christmas and the best New Year ever! This entry was posted in Holiday Rental and tagged Area Festivities, Holiday Rental, local activities, local events on December 14, 2016 by Myrtle Beach Resort Staff.